One of the popular frameworks for cross-platform mobile application development is React Native. This article provides an overview to React Native, with pointers to existing resources and some suggested best practices for writing your own React Native mobile app. Arrow functions: A new type of function that allows for a more compact, less verbose notation and with a definition of this that is static or lexical (it doesn’t lexically shadow surrounding this). See these examples of using arrow functions. Parameter definitions and the arrow of an arrow function must be in the same line. Promises: Promises are an alternative API for asynchronous programming that provide benefits over traditional callbacks such as chaining and parallel executions. This is only a sampling of the new features, but there are many others. A great online reference on ES6 is Exploring ES6 by Axel Rauschmayer. Next, let’s look at setting up your development platform and environment. A macOS computer is required to develop iOS native apps — there is no workaround. Because most mobile apps are deployed to both Android and iOS, you should consider getting a Mac for developing React Native mobile apps. Both Android Studio and Xcode tools. Install the latest versions to build and release your apps. For Android, make sure that you set up a virtual device simulator for an Android API version that you want to run against. React Native Debugger. 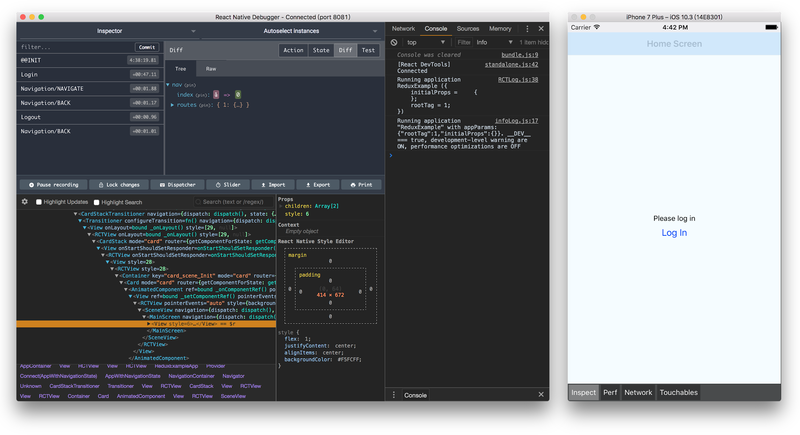 This debugger is a stand-alone app that includes React Inspector and Redux DevTools. It is a nice tool to connect to your app (one app at a time) to see and evaluate your React Native app in real-time. Note: This step creates a base React Native app template with no build configuration. Read more about the create-react-native-app project in its GitHub project. Start the app. Run the app on the simulators by running npm run android and npm run iOS. This starts the app in development mode. It also starts the Metro bundler, which detects changes and deploys your app automatically (this is great when you are debugging mobile apps). With this, you should have most of what you need to build your mobile app. Basic UI components such as View, Text, Image, TextInput, ScrollView, and StyleSheet. In addition, it provides UI controls such as Button, Picker, Slider, and a Switch (to render a boolean input). Android-specific components such as Android BackHandler, DatePickerAndroid, ToastAndroid. iOS-specific components such as AlertIOS, ImagePickerIOS, NavitatorIOS, TabBarIOS. Common components can be found on the React Native Components and APIs documentation page. One thing to keep in mind is that there is a lot of functionality that is not supported out of the box by React Native. One example is using maps, or even icons and check boxes. While these are supported by the underlying OS, React Native requires the installation of third-party libraries. In short, anything complex or not supported by React Native (this includes development tools) requires that you write additional code or use a third-party library. 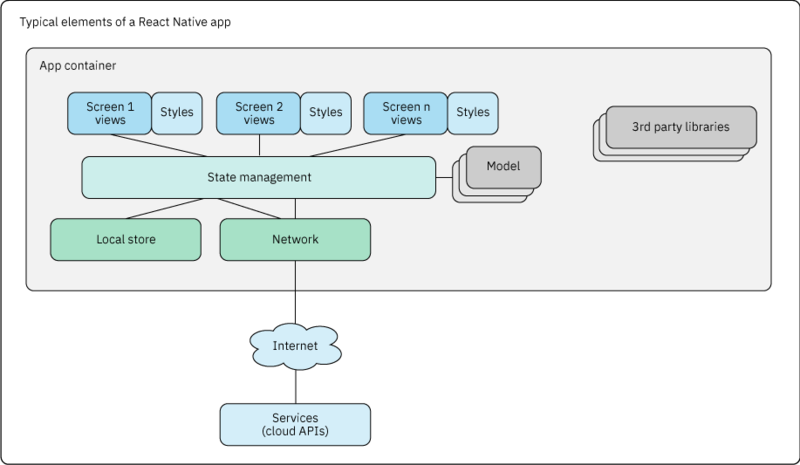 In an app container, you have a number of screens that consist of one or many views (and styles), interscreen navigation, state management, and data models. There is also local storage and network functionality to consume services on the cloud. Last but not least, there are third-party libraries to expand your app’s functionality. The following sections describe each of these areas. The collection of screens and other components of the app are contained in an app container. The app itself consists of many screens, and each screen consists of a number of views such as buttons, text inputs, and lists. Views are the most fundamental component for building a user interface, and views typically map to the iOS and Android native View components. The TaskList component imports the various dependencies, including a third-party Checkbox UI component not found in React Native, which you can download from the React Native Elements website. This approach allows for clean separation between component and styles and allows for a more compact component. Note that when sharing or reusing, it is a good practice to share the component itself and avoid sharing stand-alone styles. Styles are defined using the StyleSheet component, which is an abstraction similar to CSS stylesheets. Reference the individual UI component for specific styling properties. The Dimensions API is useful in adapting your UI in real-time as needed; for example, you can adjust your UI when the orientation changes by applying styling as appropriate. Examples of adapting the UI include changing the position and length of text input fields for landscape versus portrait orientation. There is another level of UI adaptation that you must be prepared to handle. You will encounter situations where you will need to implement behavior that is particular to Android or iOS. Examples include differences related to underlying behavior such as how a UI control renders or behaves in general. To solve this design issue, you need to apply different logic or styles, or in more complex cases, implement custom components. React Native provides different methods to detect the underlying platform so that you can programmatically decide what to do: either using the Platform module or using platform-specific file extensions. The Platform module also provides Platform.select and Platform.Version to detect the platform and platform-version respectively. For more information, see the Platform documentation. You should use Platform.OS and Platform.select only for small changes. Otherwise, you will end-up with a lot of hardcoded if or switch statements, which makes your code harder to follow. If you are writing more complex code or components, you should use the platform-specific file extensions. In this approach, you would split your code using per-platform files. That is, if you have code that cannot be made common across platforms, let’s say, our TaskList, you would then write two files, one for iOS and one for Android, and then let React Native pick up the right one. What exactly would be different between iOS and Android is not covered in this article, but things to watch out for include rendering and general component or UI control behavior. Now, if it turns out that the layout designs for your Android versus iOS app are different in major ways, you can control this by using index.ios.js and index.android.js files respectively instead of index.js for your main app. This gives you total control of the app layouts and flow for the different platforms. To minimize duplicated code, you need to repackage it into reusable helpers as necessary. App navigation in React Native is one area that can be challenging because the navigation provided by React Native is either not powerful-enough, or only targets iOS. Instead, there are a large number of community projects trying to address cross-platform navigation, with some projects more popular than others. Covering each available project is outside the scope of this article, so I’ll just focus on the popular React Native Navigation by Wix. React Native Navigation provides a pretty complete API that provides a top-level API to register screen components, start tab-based apps, and to start single screen apps. It provides other APIs to manage modal and lightbox screens, as well as lower-level screen APIs to handle the screen stack, handle buttons, screen visibility, and the ability to customize the navigator itself. Install the latest stable version of react-native-navigation (run npm install react-native-navigation --save) and follow the Android and iOS installation instructions on their website that require you to modify the build scripts or values. screen: "drawer screen unique name"
You can switch between single and tab-based screens as needed by invoking the corresponding functions. Also, note the use of drawer in the previous example. You can define a drawer side menu for both single screen and tab-based apps. In React (and React Native), props and state are used to control a component. props (properties) are the parameters used to customize components when they are created. For example, the Button components provide support for a number of properties; in Listing 10, title and onPress are props. Listing 11 is an example of simple state management, but if your application is more complex with many screen components and intercomponent state management, you should leverage Redux. A more advanced approach to state management, Redux provides a framework for implementing state management and related actions and handlers. But using Redux adds complexity to your app, so you should consider using it only when you really need it (that is, for larger complex apps). React Native provides support for local storage with AsyncStorage, a simple to use, basic key-value asynchronous (persisted) storage system that is global to the whole app. It is simple, as it requires no major setup. On iOS, it is implemented as a serialized dictionary or as separate files. On Android, it is based on SQLite or RocksDB. But AsyncStorage has a number of limitations, such as slow performance, no indexing, and no encryption. Let me repeat that: It is not encrypted. If you are storing large amounts of data and performance and encryption are important factors for your application, you should consider using alternatives like Realm React Native. Realm React Native is cross-platform, performs better, supports encryption, and even comes with its own version of ListView (with the same API signature as React Native ListView) that is optimized on top of Realm, drastically improving access to the local store. You can open and view .realm files for debugging with Realm Browser. Realm uses a static schema definition approach to improve performance. WebSockets, which provides full-duplex communication channels over a TCP connection. Fetch API, the newest member of the family, which is similar to XMLHttpRequest but with additional features. Listing 14 uses the fetch API to retrieve a small JSON file of usernames from a server. Note the use of Promises in Listing 14. These won’t fail (reject) even if the response is an HTTP 404 or 500. In other words, it only rejects on network failures. The way to detect non-network failures is to check the OK status. iOS by default blocks requests that are not encrypted using SSL. The only way to work around this is to add an App Transport Security exception. You can use NetInfo to detect or retrieve network information. It is a useful API to detect online or offline status, connection types (Wi-Fi, cellular), and effective connection type (2G, 3G, and 4G) — and it is cross-platform (for the most part). This article provides just a high-level view of React Native. React Native in general is a more complex topic. You should look into each of the areas that I covered in more detail. React Native is a dynamic and growing framework and community. But React Native is not as mature as native app development. You must keep stable environments for Android, iOS, and React Native, including all related development tools. For components that you need that don’t exist in React Native, do a Google Search and you can find what you need, keeping in mind that the selected third-party library might change or its maintenance might stop or be abandoned, which is a major risk to consider. If you don’t find what you need, go ahead and write the needed components and share them with the rest of the React Native community. Also, keep an eye on Facebook’s React Native blog for related latest news. React Native is not for everyone or every project. You need to balance the time, effort, and cost of creating and maintaining React Native code, tools, development environments, and skill-sets versus just focusing on native code. There are recent examples of large development organizations, such as Airbnb, that dedicated a lot of effort and investment on React Native but at the end decided to return to pure native development.